Not only am I subjecting my kids to stuff I remember & love from my youth, I'm revisitng my 20's through film. I have miles of picot edging to do in a mohair blend yarn for a deadline (tomorrow). 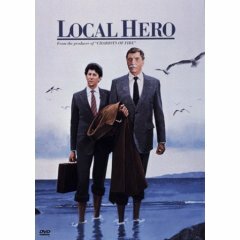 I settled in this morning with my tea & Local Hero, a movie by Bill Forsyth. It's a really sweet movie about innocence (re)discovered. There's gorgeous Scottish scenery too. Cindilou pointed out that the pattern for the side to side Opal sock is here. Anyone going to Stitches Midwest? That is one of the best movies ever. And and that is one of the best lines in it. A perfect knitting movie.